If it’s surf you’re after, the coast South of Perth in Western Australia is a dream come true. And even if you’re not planning to dip a toe in the water, like myself (I’ve read too much about the blue-ringed octopus to tempt fate - For tips on first-aid, check out the wikipedia entry), Yallingup and Prevelly beaches were heaven on earth – blond, fine, sand and a sea as blue as the purest turquoise gem. As we hadn’t planned to go to the Margaret River region at all, it was a real bonus to discover this wonderful part of the world. It’s within easy reach of Perth and the landscape is not completely alien. Somehow, we felt very at home there – the weather was lovely, hot, but not energy-sapping hot, and there was plenty to see without having to drive for 10 hours. There are plenty of vineyards around, so in some ways, it felt like being in France (apart from the snake exclusion fencing, of course). Very different from the bush we drove through North of Perth or from the desert outback around Alice Springs and Uluru. We stayed in the town of Margaret River, which was quite disappointing. It was a one-street town, with a lot of noisy traffic (the main road goes right through it), the architecture is characterless, and the shops and restaurants were not particularly inspiring. But the minute you leave town, you’re driving through enchanting countryside. The Caves road is the main drag where you’ll find all the wineries, where you can stop to taste wine or have a meal. We had lunch at the Cullen winery (yes, the Irish name was the reason we picked this one, along with a mention of good food we read somewhere). We were not disappointed. As Brendan was driving, we didn’t try the wine, but the food was delicious. If you’re ever in Margaret River, don’t miss it. Brendan had the dahl dish, and I had a mixed platter, with cheeses, quiche, olives, baby octopus, sourdough bread and other bits and pieces. There was plenty in it and it was ideal for lunch – all perfectly cooked/prepared. And the setting was really serene – a few tables in the garden, under a big tree. And there was a big golden labrador who came slobbering to every table, just for a pat on the head (and a morsel, if given half a chance, I’m sure). There are plenty of tourist attractions along the way, where you can taste wine, cheese, honey, etc. As our time there was limited, we decided to check out the beaches instead. In the morning, we stopped at Prevelly beach, which is the closest to Margaret River. We sat there for a good while, watching surfers doing their thing, and we also watched a wedding – strange place for a wedding, if you ask me, with the surfer dudes walking down the steps from the car park, doing a few yoga stretches on the beach and getting into the water to paddle towards the big wave straight ahead! The surfer dudes were not as young as you’d think, by the way. Most of the ones we saw were in their late thirties, early forties, I’d say (Nice bods, though!). The waves didn’t look that big in the distance, but when you see a surfer against it, you realise that they were a good 8-foot tall. I can’t remember exactly at what beach we saw this, but there is actually a code for surfers – i.e. rules as to who can take the wave (e.g. whoever has been there the longest, whoever is closest to the peak, etc. ), what direction to go (one goes left, one goes right), etc. I had never thought of this, but it makes good sense when you see how many surfers are out there waiting for the perfect wave! In the afternoon, we headed up to Yallingup (it means "Place of love"! ), where we had stopped the previous day. I had instantly fallen in love with Yallingup – it’s a gorgeous bay, with lovely yellow sand, just a few people around, the sea is an intense turquoise and it’s so quiet. I imagine that it gets busy at weekends and on holidays, as it’s only a 3-hour drive from Perth. There are a lot of expensive houses on the hill – probably mostly holiday homes. Apparently, members of the Australia cricket team have summer houses around here. There is a nice camp site (if we had had a campervan, we would have stayed here), and a luxury hotel, the Seashells Caves House Resort. Unfortunately, the hotel didn’t have any available rooms with sea views that day. We had planned to go to the Aboriginal Centre, but arrived too late – it closes around 4 I think. So, instead, we drove down the coast a bit more and stopped at a few lovely beaches – don’t know what they were called, and there were only a handful of people at each of these – perfect if you want a quiet spot. We had planned to go back to Prevelly beach, but found that the road was closed, due to a bush fire. I guess these are not uncommon in areas that are not managed by the Aboriginal fire management system. Our guide in Perth explained to us that the land has to be burnt at regular intervals, in order to regenerate it and ensure that some plants don’t grow too large. If these plants grow too big, the intensity of an accidental fire is such that it would cause major destruction. By keeping nature in check, they ensure that there is no such catastrophe. There is a lot of vegetation around the Margaret River coast, and I guess that this land is not burnt regularly. In a country like Australia, where droughts are common, the risk of fire is a lot higher than here, and I’d say it’s essential to manage the vegetation to prevent major fires in populated areas. Margaret River (and Yallingup in particular) would definitely be on my list of places I'd like to go back to - we'll start saving now! The last time I saw the Milky Way was in the Maldives, but even then there was some ambient light that stole away the show. On our first night in Ayers Rock resort (Yulara), the Milky Way looked just so heavenly, so bright, so plentiful, that we would have watched it all night. Well, except there were cars on the road every so often, and I didn't want to walk up to a look-out point (I can control my fear of poisonous snakes during the day, when I can see them, but I don't think you'd ever get me to walk in the desert at night, particularly on a warm night, when they might still be out and about!). I've never had a personal trainer. We see the trainers at the gym every day, but their customers never seem to lose weight or shape up, so why pay extra when all I need is a bit of self-motivation! But if the training session was in a beautiful park, shaded by majestic trees, under a glorious blue sky? Well, if you're living in Perth, it's all possible! I have no idea if the lady who was getting the training in Kings Park made any progress, lost any weight, or developed nice muscles, but it certainly looked like a much nicer environment than a gym anywhere. We ate a lot of Japanese food in Australia, mostly sashimi and sushi and bento boxes. There was just such a wonderful choice in Sydney and Perth. In Perth, we stayed in the Holiday Inn on Hay Street. There was a fast food type sushi bar across the road, where we had lunch the first day we arrived. One evening, as we were sitting at the terrace outside the hotel, we noticed that the sushi bar had a table on the street with lots sushi boxes on it, and people were stopping by on their way home and buying sushi there. There was a constant stream of people and the boxes were flying off the shelves. They were selling off their leftover stock at half price! So I popped over the road, and bought myself a little sushi box and ate it at the terrace. You definitely wouldn't see that in Dublin - I think that restaurants would rather throw away the food than selling it at half price! And did I tell you my favourite thing about take-away sushi boxes: it's the soy sauce bottle - it's a tiny little plastic fish with a red top. I don't even like soy sauce, but I love the design of the bottles! I found a website that sells them empty and you can fill them yourself with soy sauce (they also sell a lot of other whacky stuff)! We did see a billboard advertising snake exclusion fencing in the Margaret River area. Imagine the horror! In Margaret River, I guess this type of fencing is mostly used around the vineyards, but I have found this fascinating article on how to snake fence your house in Canada's British Columbia. I'll make sure to remember this if I ever decide to emigrate! 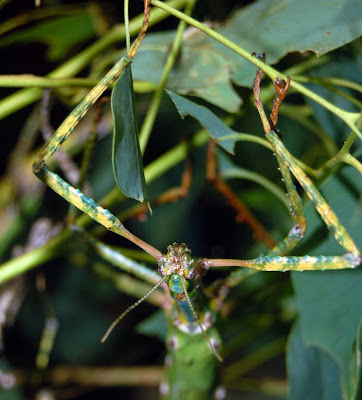 I have also found this really interesting article on Fauna Sensitive Road Design. Given the number of dead possums we saw in New Zealand and dead kangaroos in Australia, there is definitely a need to take action to help all animals cross the roads without being run over. We did see a sign for crossing reptiles in the Uluru National Park, but we didn't see any big lizards or snakes crossing the roads at all. Given the large numbers of snakes in the country, it's hard to believe that we didn't see a single one while in Australia (and, believe me, I looked!). Actually, I'm telling a lie, we saw lots of snakes in the Sydney Wildlife World, an excellent place to go if you want to see all the creepy-crawlies and the cuddly koalas. 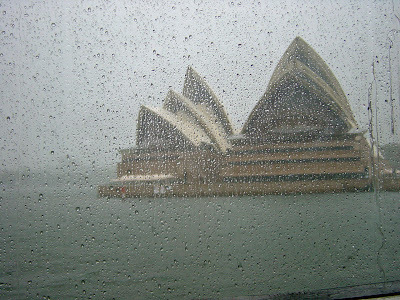 We spent hours there on a wet day in Sydney. Make sure to visit their games page where you can play Raymond the red-back spider trying to catch flies. What fascinated me more than anything was all their "weirder than fiction" facts posted all around the place. 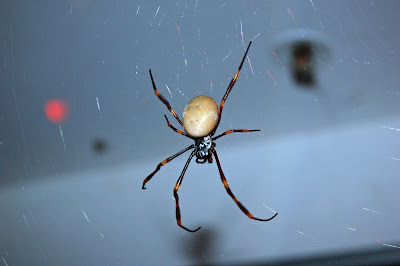 For someone like me, who has a strange fascination with venomous snakes and spiders, it was the perfect place to face all my fears! By the way, I want it to be known that I would have no problem touching a snake if I knew it's not venomous! And we saw a tiny little snake on the path around Uluru. But it was so small, and it disappeared into the bushes so quickly that it doesn't really count. It took me a few days to cop on to this! Actually, it was the 8th of February, 9 days into our trip, when we were driving from Kaikoura to Oamaru, that I realised that, at midday, the sun is due North, not South. I had assumed we would be facing into the sun on our drive from North to South, but realised after a couple of hours that it was just the opposite. Throughout the trip, I found it really hard to orient myself by the sun. Here is another picture of Uluru, just for you. I like the way this one is framed by the burnt tree. Over the holiday, we’ve tried to understand a bit more about the Aboriginals and their place in Australian society. We saw very few Aboriginals at all – none in Sydney or Perth, just a few in Geraldton. Alice Springs had a good few, but they all looked drunk or drugged, sitting under the trees in the town centre. A tour guide we overheard said that the Aboriginals in Alice Springs have been kicked out from their own community, because of alcohol abuse, and they are relying on government welfare. A lot of Aboriginal communities are dry communities – no alcohol allowed. They have an agreement with bottle stores so that no alcohol is sold to Aboriginal people, and the elders ask tourists not to buy alcohol for them. That said, we saw 2 Aboriginal ladies in the back of a taxi (driven by a Sikh, strangely enough), buying plenty of supplies from the Bottle Store in Alice Springs! The Aboriginals we saw in the shopping centre in Ayers Rock resort were very different – laughing teenage girls, smiling baby looking straight at you (the Aboriginals in Alice Spring looked right through you like you didn’t exist), ladies painting in the Cultural Centre (the sale of Aboriginal art is a big thing over there) - they looked quite absorbed in their painting, until one of them chipped in to something that the white shop assistant was saying to a tourist). We didn't see a real indigenous community anywhere, though - I think that in most cases, you can only go into Aboriginal communities by invitation. 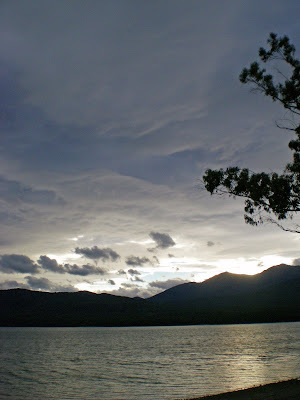 There are vast areas in the Northern Territories for which you need a permit to enter. It’s hard to get a straight answer from anybody we asked about the relationship between Aboriginals and white Australians. Our Aboriginal Tour guide in Perth, Greg Nannup, was clearly well educated, well spoken, confident and able to navigate his way between the 2 worlds. He said that there are Aboriginals who live a Western lifestyle, and that there are mixed marriages (His mother is part Scottish and Irish, and he had very pale skin and pure blue eyes). He was a very entreprising young man, full of enthusiasm and plans for his business. By the way, I highly recommend his Kings Park Aboriginal Tour in Perth - we learned a lot about indigenous history, traditions, bush tucker medicine, use of plants, etc., and he answered all our questions thoroughly. It was a newly established tour, and there were only the 2 of us on the day, which gave us a very personal experience. 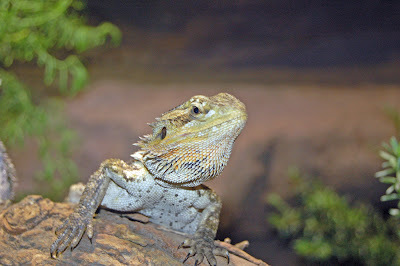 He was well prepared, had a lot to talk about, and we felt that the 90-minute tour was extremely good value for money. Plus Kings Park is the best location in Perth! We wish him well. On the other hand, our taxi driver in Alice Springs said the relationship between the 2 communities wasn’t good – that the government was trying to help the Aboriginals but that they didn’t help themselves. The tour guide we overheard yesterday said that life expectancy for Aboriginal women is 45 years! A couple of articles we read in the papers here indicate that living conditions in Aboriginal communities are poor. It’s hard to imagine that a modern country like Australia is OK with letting over 1 million of its population live like this, with poor access to education, health and employment. I read a very interesting article about 2 teenage girls (cousins, 16 & 17) from the Northern Territories sent to a friend's house in Sydney for a few months. They came from a good family, and a dry community. Their parents had sent them to school every day and only wanted the best for them. But school was poor - there were only 2 classes, so a 12-year-old would be in the same class as a 6-year-old. The teacher only got them to copy the same old books over and over again, so they could write, but their reading skills were poor (they read the 1st letter of a word and guessed the rest). Maths was even worse - they could not do any multiplications. And that was on the days when school was running for more than 2 hours. The school had tried to bring in teachers from outside but nobody wanted a job in the middle of nowhere. The parents had sent one of the girls to an Aboriginal boarding school to try and improve matters, but there was such a large gap in her level of education and the girl was so miserable there that she couldn't stick it. The friends in Sydney helped the girls study for the few months that they stayed with them, and found that they made huge progress. One of the girls wants to become a teacher. Will she ever catch up enough to fulfill her dream? It's hard to imagine how that would happen. This article was a full page in a daily newspaper - how can a Minister for Education read this and not do anything about this dire situation? On the other hand, someone told us that the government has had to withhold unemployment benefits for families whose children don’t go to school – it was the only way to improve school attendance. My impression is that of 2 different worlds – one for the white Australians and one for the Aboriginals, with different expectations and different dreams. But surely every parent wants their child do be healthy and to live a good life? And surely the Australian government is not comfortable with one million of its population living in third world conditions? But who am I to comment? We were only tourist there for a few weeks, and we didn't even spend time in Darwin and the Northern Territories. Nearly the end of March, and it's bitterly cold, with a Northerly wind going right through you! We went for a walk on the South Wall this afternoon. I had a nice warm coat with a hood, but the wind was blowing so hard on the way back that I had to hold the hood up - my hands were frozen. 22 degrees in Sydney, 28 in Perth and 34 in Alice Springs. Wish we were there!! And this one of course - with the reflected light and the darker tones in the shade. And I also love this close-up. And then again, I like this one too. This one is also a sunset picture - you can see the shadow reaching the base of the rock. Very hard to pick a picture of Uluru to show you. We have literally hundreds. I like this one because of the intensity of the sky, although it doesn't give you a sense of scale. We're a good few kilometers away from it there, and a picture doesn't quite convey how it dominates the landscape, not so much by its size, but by its pull. It's so there that you can't look at anything else. I promised you more pictures... The Uluru pictures are not quite ready yet - it takes a while to review, straighten and edit 2,500 pictures. 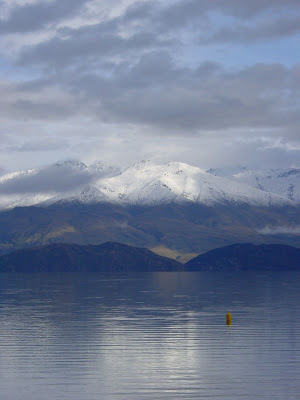 So, here are pictures of Lake Wanaka. Rather than add them all one by one here, I've posted into a Picasa web album from Google. Click here. You can see them in a slideshow, which looks really great if you've got a decent screen and Internet Explorer (for some reason, the slideshow feature doesn't work so well in Mozilla (maybe I need to update to a newer version - the one I have is 1.7.12). We're big fans of Picasa - it's very easy to use, it's from Google and it's free! It seems that airports are the only place where I get a chance to write my blog these days. We’ve got an hour and a half before our flight, but I guess the laptop’s battery will give up the ghost before boarding time. We’ve just spent 2 wonderful days in Ayers Rock, where we visited the Uluru/Kata Tjuta national park. 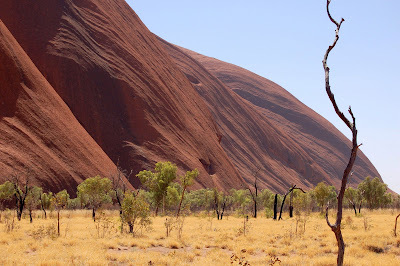 Uluru is more than just a rock – it has deep spiritual meaning for the Anangu people. Some parts of it are so sacred to them that you are not allowed to photograph them. Although the climb is apparently a popular thing, it goes against the Anangu laws (or Tjukurpa). Not only is Uluru a sacred spot, but the other reason is that, as owners of the land, they feel responsible for the safety of all visitors. But strangely enough, they won’t stop you from climbing, they simply ask you not to. From my limited experience here, it strikes me that Aboriginals are not very forceful people. Why anyone would want to risk their life climbing Uluru is beyond me anyway. The climbing point is sheer smooth rock going up at an impossible angle – and if you manage to climb to the top, I really don’t know how you’d get back down safely. Apparently 35 people have lost their lives trying to climb it. We chose to do the base walk, which took us over 4 hours, after a sunrise viewing (we got up at 5:30 in the last 2 days to get the best sunrise views). Being so close to Uluru was just wonderful – no pictures you’ve seen quite prepares you for how majestic and magical it is. The light changes constantly and the vegetation close to the base is a lot richer than you’d have thought – plenty of trees and grasses, and lots of birds, particularly near the waterholes. Mutitjulu is the only permanent waterhole in the area, and there are dozens of zebra finches swooshing around – the sound of their wings close to the cliff face was quite unreal. The Cultural Centre was interesting, with plenty of gorgeous paintings, a movie about the Tjukurpa, with story telling, dancing and drawing in the sand illustrating it. Tjukurpa is a term the Anangu prefer people to use, rather than “dreamtime” or “dreaming” , as it is very real to them, not just mythology, religion and tradition, but actual law, code of conduct, and way of life. They say it’s not just the past, but also the present and the future. I read in the Cultural Centre that they don’t believe in laws written on paper, maybe a reason why they have such poor representation in government. Have a look at the Visitor Guide if you want to find out more about Aboriginal beliefs and way of life, and about the Park in general. The Aboriginals see themselves as the custodians of the land in Australia– their role is to take care of the land, and they feel a close bond to it. Given the resources available in this land, you can understand why you need to take care of it. I read in the Lonely Planet guide that the soil in Australia is really ancient, that no new soil has been formed in a very long time, and that water seeping through it has been leaching it of all nutrients for 100 million years. On top of this poor soil, Australia is affected by the El Nino cycle of flood and drought. While the Aboriginals are taking care of the land, and only using the resources available from it, white Australians seem to be over-farming every bit that they can. You get the feeling that in another thousand years, there will be nothing more to farm, and that all “white fellas” will leave, leaving the land to the Aboriginals, as they’ll be the only ones who’ll be able to survive – maybe that’s why they don’t seem to push much for a place in Western society. It won't be there forever, so why fight it? 8 years today! The best cat in the world! We’re sitting in the Perth airport Domestic terminal, awaiting our flight to Alice Springs. It’s nice and cool in here, but out there in the sun, temperatures are well above 30 degrees. Perth is a hot city, where the sun never ceases to shine. It must be a really boring job to be a weather forecaster here – blue sky and sunshine every day. When we got to Western Australia last week, we rented a car and set off North of Perth at 6:30 am – our goal was to get to Monkey Mia (over 2 days’ drive), but there was a cyclone near Exmouth (a bit further North – probably 500 Km – this is a big country), so we decided to head back South after 2 days in Kalbarri. Kalbarri is where we encountered our first live wild kangaroos (we had seen a few dead ones on the road from Perth – not a surprise when you see the size of the lorries (big 3-trailer road trains) and the metal guards in front of the cars’ front bumpers. I guess that if a kangaroo jumps out in front of your car, you keep on driving – we heard on the radio that there had been a car crash the night before, where a lady swerved to avoid a kangaroo, and her son died in the accident. Although the radio broadcasters didn't say it in so many words, it sounded like the kid wasn’t wearing his seat belt, as he got ejected out of the car. I guess it must be a struggle at times, but, without a belt, a minor accident can turn into such a tragedy. My heart goes out to this poor lady. 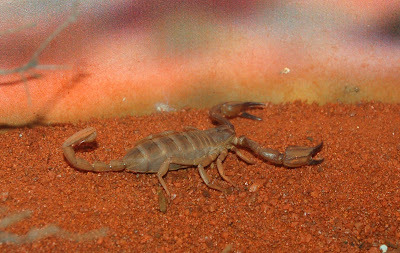 Kalbarri is also where we saw our first real bush and red earth, and where we experienced the flies! The minute you leave your air-conditioned car, millions of flies descend upon you and settle on your clothes and your face. The worst bit is when they try to get in between your glasses and your eyes, or in your nostrils. The sea was quite rough and I took dozens of pictures of waves crashing on the beach (plenty of nice beaches around Kalbarri). It was hot up there, and it felt like the real country, not some prettified version of Australia. The roads were good, not busy at all, apart from the road trains, and Brendan talked me into driving for a bit. This was my first time driving outside of Ireland, and my first time driving an automatic. I can’t say I enjoyed the experience, but it wasn’t as bad as I thought. 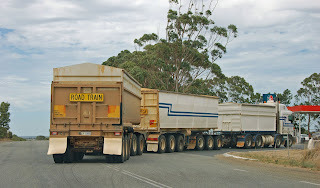 I even overtook a road train, a nerve-wracking experience, which I undertook reluctantly (and after much swearing! ), but in the safety of an overtaking lane, it has to be said. Brendan had to keep from laughing when he saw the look of concentration on my face. In total, Brendan drove over 3500 km, while I just drove for an hour and a half! 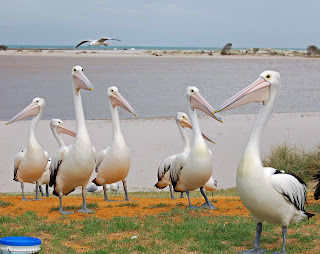 We saw pelicans up close on the beach in Kalbarri (they do a daily feeding – we don’t approve of feeding wild animals, but it does provide good photo opportunities). After 2 nights in Kalbarri (we stayed in the Kalbarri Seafront Villas - nice apartments, with all the facilities you need), we drove the whole way down to Perth and beyond (over 7 hours of driving) and stopped in Mandurah, a suburb in the South of Perth – a nice little town by the sea. We stayed in a motel and really enjoyed our evening there. Plenty of places to eat all around the seafront, and a lovely walk by the water. We ate in Han’s, an Asian eatery with the cheapest prices in town, and excellent quality food. Han’s have a few branches around Western Australia (we saw another 2 in the city centre), and it looked like the one in Mandurah is brand new. I had a delicious Thai beef salad and garlic squid, while Brendan had a Vietnamese prawn roll and a green curry. 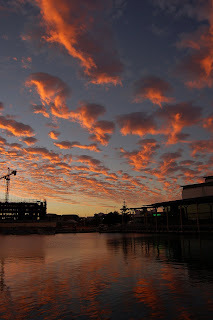 We were sitting on the top balcony, with the sun blazing down over the water, and we both enjoyed the food and the scenery – gorgeous sky - plenty of puffy clouds reflected in the water. In the morning, we slowly headed further South towards Margaret River. We drove for a bit around the Mandurah suburban estates, stopped at a lovely beach, where school kids were getting their swimming lesson – it beats the cold, drab, swimming pool where I learned to swim. As we were following a detour through an estate, we saw a sign for kangaroos at the side of the road, and, lo and behold, there were 4 kangaroos leisurely grazing in a park nearby. We got out of the car of course and took as many pictures as we could, but, unfortunately, they hopped off before we could take close up photos. J'espère que tu vas passer de bonnes vacances de Pâques! 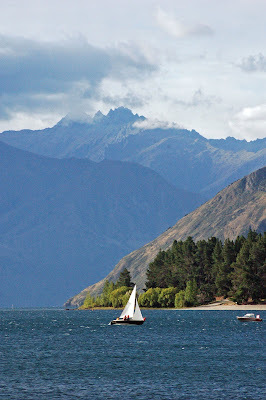 Yesterday, we sat out in the sun in the afternoon when we got to the campsite in Wanaka (and I actually got slightly sunburnt on my tummy – I had applied factor 20 on my face, my arms and my chest, but forgot my stomach). Last night, we were woken up by the heavy rain, which lasted for hours, and this morning, we woke up to the view of the mountains over the lake completely covered in snow! This is their August, and snow is not expected for another month at least, but snow there was. 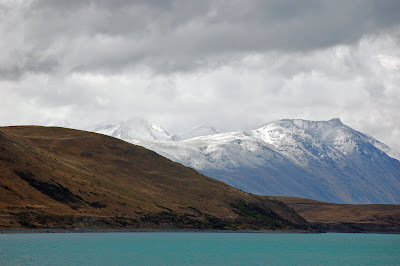 We moved on to Lake Tekapo today, and were glad to find all roads were fine and dry, including Lindis Pass. Unfortunately, the sun has deserted us and we have the heat on in the campervan this evening. I put on all the layers I had to go into town this afternoon, and I bought a woolly hat, made of merino wool (a big thing here) and possum. Now, I wasn’t sure what a possum looked like, but the shop assistant kindly showed us a stuffed specimen and told us that it’s the dead furry things you see on most roads here (which, up to now, we had called “unindentified road kill”!). Sometimes there is something as too much information! Wanaka was a lovely little town on the lake (Lake Wanaka. For an interactive webcam view, click here - don't forget that it's the middle of the night over there if you're in Europe. Also, have a look at the panoramic photos, such a gorgeous place - you'll need java to see these. ), with a few nice shops (one of the best souvenir shops we've seen), a nice lakefront walk, good public facilities, and plenty to do (it has a lot of festivals and high-octane activities, if you’re that way inclined). While sunning myself, I watched the local rugby team in training from the back of our campervan – to be honest, they didn’t look fierce at all – I don’t think they’ll make it to the All Blacks. It was a lot colder this morning when we got up, and the snow on the mountains was a big attraction for all the tourists in the town. And the pies from the local bakery were only gorgeous. I had a vegetable pie and Brendan had a chicken and corn pie, all before setting off at 10 am this morning. 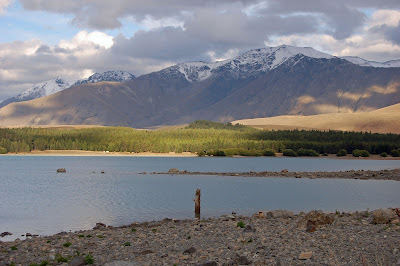 Lake Tekapo is a very scenic location too – the lake is this fantastic turquoise colour that looks completely unreal. But unfortunately, the sun didn’t come out much, so it looks a bit dull right now. The town of Lake Tekapo has put in place a big development plan to relocate the town centre closer to the lake and improve the tourist amenities. It's badly needed, to be honest. The town itself is one drab street, with some tourist shops and a few very big restaurants that obviously cater for the coach tours that stop over here at lunchtime on their way to Mount Cook (The Kohan Japanese restaurant offered great bento boxes, though!). Arrowtown, Te Anau and Wanaka were much prettier – though Lake Tekapo would have looked just as good with a bit of sunshine. On our way to Christchurch tomorrow, where we have one night in a hotel before we fly off to Perth and Western Australia. 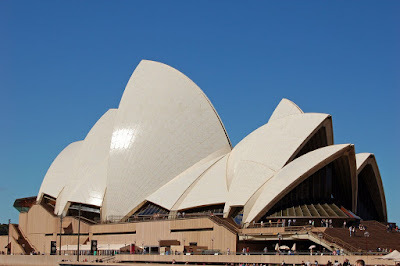 And I still haven’t finished telling you about Sydney, nor about the interesting facts and figures I’ve read in the Lonely Planet guide. I kid you not, this was the headline in Arrowtown this morning. A deeply troubled town… I think the town elders will need to meet up and take drastic measures to prevent further social decay of their little idyllic town. 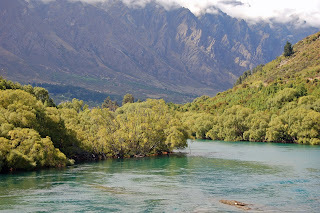 A couple of days ago, we thought we might take a coach from Queenstown to Milford Sound and stay an extra night in Arrowtown, as we didn’t want to face a difficult mountain road. But a fellow traveller (a lady from Vancouver whose campervan was stopped at the same lookout point as us) told us yesterday that the road from Arrowtown to Te Anau was fine (and their campervan was bigger than ours), so we decided to chance it, and we’re glad we did. 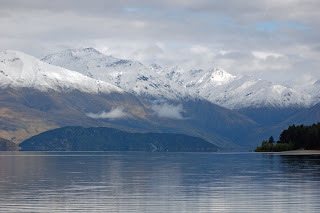 The road follows lake Wakatipu for a bit (spectacular views, and a good wide road), then, after Kingston, it follows a wide valley for most of the way to Te Anau. Not a single switch-back bend or narrow stretch of road (see map here). And Te Anau is such a glorious setting – Te Anau Lake and the Fjordland mountains in the background make for perfect photo opportunities all along the shore. The Top 10 caravan site is quite packed, but we have a good spot at the back, and the sun has been shining all afternoon, so we’ve had a great day all told. 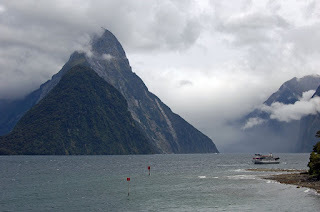 Hopefully the weather will hold for tomorrow (the 4 Square checkout lady told us it was supposed to), as we’re going to Milford Sound on a Fly-Cruise-Coach trip. But even if it’s raining in the morning, I’m sure we’ll have a great day. Those mountains look spectacular, even in the rain, I’d say. Just as well, as it rains a lot in the Fjordland – 6 metres of rain per year! PS: As it turned out, the weather "collapsed" at Milford Sound the following morning, and we ended up on a coach rather than a plane. And we were glad we did - we were not supposed to make contact with the tour company until 11 am, for a 12 o'clock flight, but we happened to walk by their office at 9:30, and I decided to pop in. They told us that they wouldn't be flying, but they could book us onto a 10:00 coach. It was a mad dash back to the campsite - thankfully I had our bags organised the previous evening - and we got on the coach all right. Fabulous road (plenty of narrow roads and switchbacks, and quite a few coaches working to a schedule, so we were delighted not to be in the campervan), and Milford Sound was out of this world. The weather was not quite as "collapsed" as they had made it out to be, and it lifted enough later in the day for planes to land and take off. Brendan has flown to and from Milford Sound on Microsoft Flight Simulator, and we would have loved to experience it for real, but it wasn't meant to be! 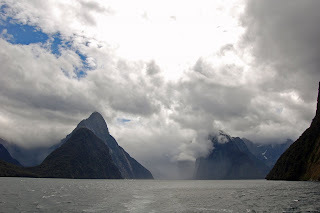 When we got to Milford Sound, it was straight onto a boat for our cruise. Brendan and I got the best spot on the boat - right at the front on the open deck. We were glad of our extra layers and rain jackets. It was breezy and cool. And wet when we sailed straight through a low cloud. I took lots and lots of pictures, but none of them quite render the sheer magnitude of the place, and the sense of wilderness (despite the few other big boats on the fjord). Milford Sound is a place I'd definitely would like to go back to, and stay overnight, as the light is said to be best at dawn and dusk. 8 February - BB of course! - this was the whole reason for our big adventure. This was the main headline on the newspaper board in Arrowtown today. And if you’ve been to Arrowtown, you’ll understand the horror! 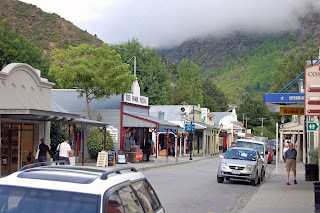 Arrowtown is a picturesque, quiet little town in Central Otago, about 20 minutes from the buzz of Queenstown. It’s full of historic buildings, but it looks a bit like a Disney set for the quaintest American town you can imagine. A Gilmore Girls kind of town. I’m sure they bring the pumpkins out at Halloween! And I’m sure it’s won tidy towns competitions year after year for the last 20 years at least. Dogs are not allowed in the centre of town, though, strangely enough, cars are. Hopefully they’ll change that soon! It’s full of little antiquey types of shops and restaurants. All in a wonderful setting, surrounded by majestic mountains. I nearly forgot to mention a great Indian restaurant, Mantra. Nice setting, with a blend of modern and traditional, and really nice food. Brendan rated the Prawn Balchoa very high (only low point was the small number of prawns – only about 8). Very good service, if a bit too enthusiastic for our taste. If you’re in Arrowtown and you like Indian food, make sure to try it out. 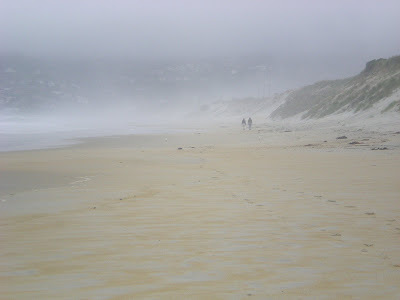 The weather did clear eventually, but not before we left the Otago peninsula. It lifted for a few minutes, and we could almost see the sun, but then the fog settled back down, and the cliffs disappeared again into the mist. 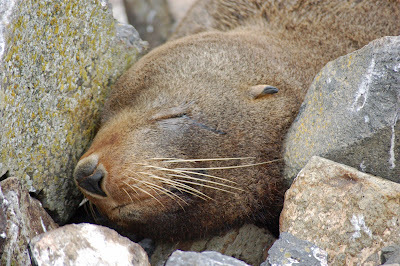 We did get out of the campervan, though, and saw New Zealand fur seals, spotted shags, and a big, big, albatross (there is a webcam to see the albatross in the colony, but every time I check, it's nighttime in New Zealand! ), and a few dead rabbits and seagulls (it would appear that poison is laid around the perimeter of the albatross sanctuary to prevent pests from getting in). And then we had a spot of lunch, read the papers some more and headed back towards the campsite. The fog has lifted over here, but it looks like it’s still lingering over the peninsula. We’re heading to Arrowtown tomorrow, so it’s bye bye foggy Dunedin, hello sunny (hopefully) Central Otago. Now, back to Sydney. Well, so much for the sun always shines in Australia. We got a bit of sunshine in the late afternoon on Saturday. That was it – the skies were grey for most of the time, it rained a good bit on Sunday, and it poured out of the heavens on Monday the 4th. I don’t think I’ve ever seen so much rain. It just would not stop. 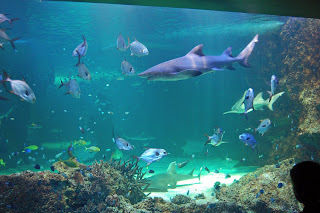 We did go to Manly beach, and crossed the main avenue to the seafront under torrential rains, took a 5-minute look at the sea, then turned back to our ferry back to Darling Harbour, where we spent the rest of the afternoon at the Aquarium, like most tourists in town that day. (Here is a link to the crocodile webcam. You can view the crocodile from below and from above - at the top of the stairs, there is a warning sign saying that "If the fall doesn't kill you, the crocodile will!" Charming!). Great Seal and Shark underwater tunnels and a fabulous reef aquarium, by the way. 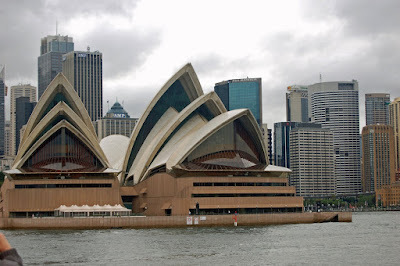 Sydney has got this great network of ferries criss-crossing the harbour, and we found it the best way to get around. Along with the trains/subway, trams and busses, Sydney seems to have an excellent public transport system. As our luggage did not make it on the same plane as us (despite the assurances from the British Airways representative at the gate), we took the train in from the airport to our hotel, the Grace Hotel on York Street. Double-decker train carriages, very quiet on a Saturday morning of course, and we were at our hotel in about 20 minutes. And it cost us about € 14! Compare that to the € 70 we paid for our taxi to Dublin airport, and the time spent stuck in traffic on the M50. I was delighted with the Grace Hotel, which Brendan had picked on the Internet. It’s an art-deco style hotel, with a lovely old-world feel, but modern facilities, and is within easy reach of most attractions. We got a room upgrade for $20 a night, and stayed in a corner room on the 8th floor, with a glimpse of Darling Harbour, which is only a 5-minute walk away. Hundreds more pictures to pick from (we took over 2000 over the whole holiday! ), so the pictures I'm posting right now are not necessarily the best ones, but I think I'll wait for Brendan to review and edit them before I do major work on the pictures. We’re here at the top of the road on the Otago Peninsula, near Dunedin in New Zealand, and the weather looks like it’s just about lifting. The area is supposed to be beautiful, a big headland with a cove on one side and the ocean on the other, but we haven’t seen much of it so far. We drove here in complete fog, and we’ve been waiting for the last half hour or so for the weather to lift. Although the forecast is for some rain today, I’m forever hopeful that the fog will lift. It was 7:30 last night when it finally did and we got a glimmer of sunshine over St Kilda’s beach, just beside our campsite. Campsite? you ask (Véronique knows I hate camping!). No, no, I’m not roughing it. We’re travelling in a Kea campervan, with our own shower and toilet, our own little stove, fridge, microwave, and even air-conditioning (for full details, click here)! New Zealand has got the best network of power sites where you can plug in your campervan and live in (relative) luxury. We’ve just had a cup of coffee (Brendan) and hot water (me) and 2 blueberry muffins, and Brendan is reading the Sunday paper. It’s not all been rain and fog, mind you. We travelled to New Zealand on the 6th of February, and we arrived in Christchurch to pure blue skies, sunshine, and a strong easterly breeze. We picked up our campervan at the airport, and drove North to Kaikoura, a small town on the east coast of the South Island. The road was pure heaven – gorgeous, dry, hilly country, and then beautiful views of the sea as we got close to Kaikoura, a small resort, whose main claim to fame is its sperm whales. There is a deep sea canyon (about 1 Km deep) close to the shore and young male sperm whales feed in its depths, all year round. They go down to the depths and come back up for air every hour or so. They’re only about 3 miles offshore, so it makes for an easy trip out to sea. Well, relatively easy – the easterly wind was quite strong and the sailings after ours were cancelled, as the sea was getting too rough. We survived our trip, despite the heavy swell – nobody got seasick, and we did get to see 1 whale and plenty of dusky dolphins. By the way, if you want tips to avoid seasickness, here they are: takes layers off to cool your body down, find a spot on land and fix your gaze on it (it will trick your mind into thinking you’re on steady ground), and pinch your ear lobes. It certainly worked for me (and I was feeling queasy on the bus on the way to the boat). The trip was very well run (by Whale Watch Kaikoura, the only show in town, as far as we could see – we had booked it months in advance): a good boat, professional crew, with a whale spotter, a friendly guide, and even a health and safety officer, who constantly scanned the passengers to make sure we were not turning green. The whale was smaller than what I had expected (I guess I didn’t do much research on what sperm whales look like, though the sperm whales are the 4th largest whale in the world), but it was a great trip. The sun was shining, the sea was a beautiful turquoise blue (real South Pacific colour), if a bit on the rough side, and we got plenty of fresh air. 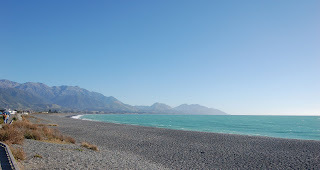 I’d recommend Kaikoura to anybody going to New Zealand – the scenery is fabulous (we saw it at its best, with pure blue skies), it’s a small enough town, but it has plenty of restaurants, and a good campsite (Kaikoura Top 10 Holiday Park). And I forgot to mention the seals. There is a seal colony at the edge of town (a good hour’s walk) – they’re not very close to shore, so make sure to bring your binoculars. It’s taking us a bit of effort to get the New Zealand accent – When the guide said “Wilcom to our vissil”, it took me a second or two to get it. And never mind the “uni-six toilets”! 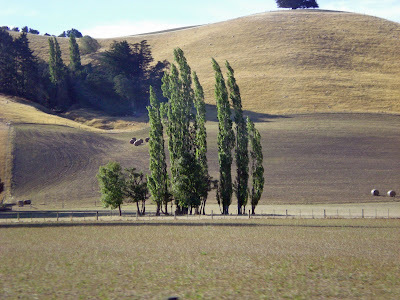 After Kaikoura, we drove down to Oamaru (a long, 7-hour journey – the landscape south of Christchurch is flat and quite boring, unless you’re interesting in cattle and irrigation methods). 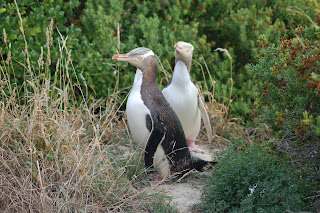 Oamaru’s claim to fame is its yellow-eyed penguins, one of the rarest in the world, apparently. 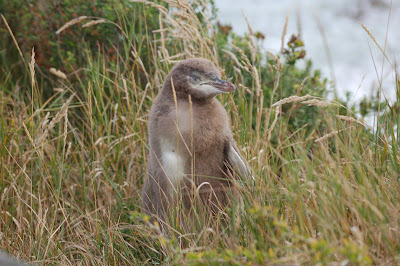 (Oamaru also has blue penguins, but you have to pay to see those!) The yellow-eyed penguins come out of the sea in the late afternoon to feed their young, who are waiting for them in nests on the hills. We were wrecked after the journey, but we dragged ourselves to the beach outside the town. And it was well worth it. We spent 2 hours there. There wasn’t much happening for the first half hour, apart from a couple of penguins in a nest on the cliff in the distance. Then the first penguin came out of the sea, spent a bit of time drying herself on the beach, then another one 10 minutes later. Nothing much happened for another while – there were 2 or 3 penguins on the beach, standing there waiting. Then, a penguin appeared on the hill, hopping towards us. Now, these are fairly steep hills, with plenty of vegetation – I would not like to have to climb up from the beach, and I have 2 hands and fairly good feet. Imagine a penguin hopping its way up this hill – exhausting work I’d say, and that little penguin took a few breaks on the way, then hopped right past us into a bush, and came out again, this time with a slightly smaller penguin in tow (its young, I presume), took a look at us (and the other 20 people there), and went back into the bush. After another while, and a little further on, we saw a baby penguin, all fluffy and cute, hopping past us and into a bush. The best pickup cure after a long drive. We took plenty of pictures, needless to say. And here we are, and the weather at the Otago peninsula still hasn’t lifted (it lifts for a bit, then comes down again), but my battery is nearly out, so no more writing until we get back to the campsite this evening, when I’ll tell you all about Sydney, the first leg of our journey. In the last month, we've only had sporadic access to the internet, hence the long radio silence. And we've been so busy seeing the world and enjoying every moment of it that I haven't had much time to write, except in airports, while waiting for flights. Over the next few posts, I will be telling you all about our holiday of a lifetime - Australia and New Zealand!